This is not done by jostling in the street." I think the mountains should be a space of freedom and of purity. And of the elevation of the soul. Tired of the never ending question of why do I go up there and risk my life and meet great sufferance, I thought for many times of trying to condense into one single phrase my mountaineering credo and philosophy: "Climbing mountains Outside is climbing mountains Inside". For me it is just as simple and as basic as that. At the first glance this might seem contradictory but it is not. And I do not have any wish or any need to be more explicit than that. It is just who I am. Period. Only a few days ago I had the assignment of writing a few words for Cotidianul, one of Romania's biggest daily newspapers and I think the lines are quite properly chosen to fit my curent posting on CloudClimbing: "Our base camp is a kind of a global village whose tents are united by an invisible common wire: the successful ascent of the summit. Italians, Polish, French, Americans, Spanish, a Romanian etc etc. Some of them I know from other expeditions, some of them from the internet, due to their achievements. With some of them you become a close friend, others remain just some people you've met and some you will not remember at all. It's like in life. A base camp, if it gets to accommodate a significant number of climbers, will simply reflect the outside world at a microscopic scale. This is what I think. Without any idealizations. That's why I usually prefer the locations where there's a fair chance to meet fewer teams on my chosen route. But you are here for the mountain and for having a special life experience." At the same time, the people in the base camp are the people on the mountain. No different. With their pluses and minuses, their strengths and weaknesses. For some, the pluses and the strengths gets bigger, for others, the minuses and the weaknesses might get bigger as well, I guess. But I am not here to judge, for I do not have the right to judge. But I cannot stand liars especially when their lies can affect the decisions and the future actions of other people wishing to climb. Decisions that can endanger their lives , especially when they want to choose a commercial outfitter for their "expedition", or when they make up their minds to go for one peak or for another. On the night from Saturday to Sunday July 6th a big number of people made a push to the summit. The first to reach it was the team comprising Slovak Peter Hamor and Polish Piotr Morawski. It seems before them came the Spanish Jorge Ecogheaga, but he went on a wrong point of the summit area and then when he realized he was not on the right position for claiming the summit he went after Hamor and Morawski. Herbert Rainer, the guide from Amical Alpin stopped around 50m under the top and said to his clients that this was the top (info I got from one client of Amical). When one client said the top is obviously higher, the guide was constrained to take the client to the real top. Eventually, the summit (if they went to the true summit and not on the point where most of the people went) was reached by Herbert and client Ralf Arnold. 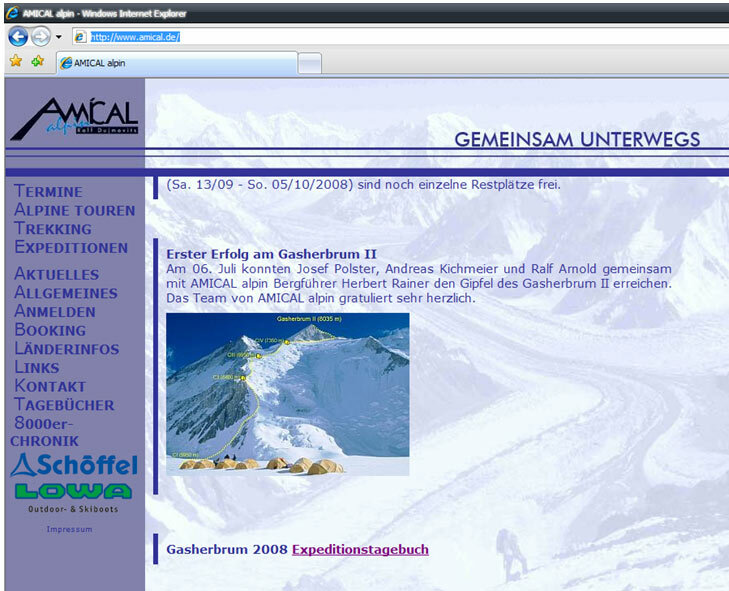 On the Amical Alpin website (www.amical.de, but also you can see the print screen) is clearly stated that the Amical Summiters were Josef Polster, Andreas Kichmeier and Ralf Arnold. According witness accounts (inside Amical group) Andreas Kichmeier stopped 50m under the summit. 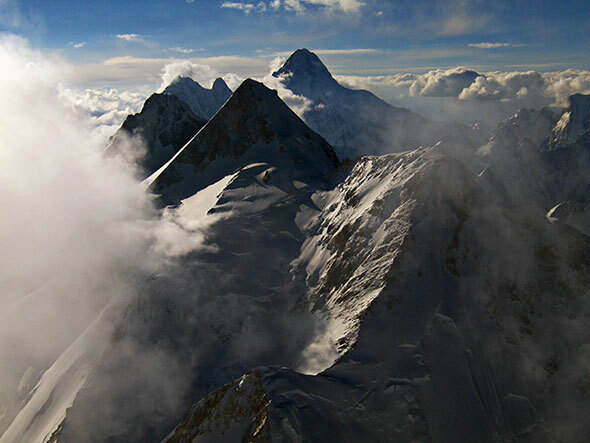 The German translation of their website announcement reads: "First success on Gasherbrum II. On the 6th of July, Josef Polster, Andreas Kichmeier and Ralf Arnold together with the AMICAL alpine guide Herbert Rainer reached the peak of Gasherbrum II. The team of AMICAL alpin is heartily congratulating everyone." 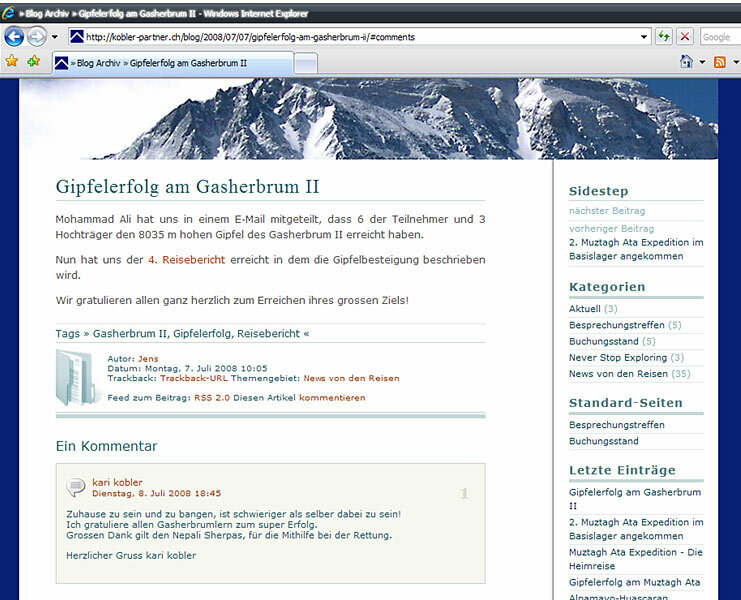 On Kobler&Partner website (http://kobler-partner.ch/blog/ , but you cand also see the print screen) we found an announcement posted on July 7th: "Peak success on the Gasherbrum II. Mohammad Ali has informed us in an email that 6 of the participants and 3 of the porters have reached the 8035 m high peak of Gasherbrum II. The 4th report of the journey has reached us now, in which the ascension is described. We are congratulating everyone heartily on the achievement of their great purpose! "...followed by a comment on July 8th, written by Kari Kobler himself: "To be home and to be scared is more difficult than to be there in person! I congratulate all Gasherbrumers for the extraordinary success. A big thank you for the Nepali Sherpas, for their help in the rescue mission. Regards, Kari Kobler". When asked in base camp by Polish Pawel Michalski, how many persons from Kobler's team summited, Klaus, the outfitter's guide, answered he doesn't know, since it was fog. So, one guy, guiding one eight thousand meter peak, did not know, three days after the ascent, how many of his clients summited! Last year two of the Amical Alpin clients died on Gashebrum 2 in an avalanche (plus one into the Base Camp) and more being injured in what was a crazy summit push determined by the lack of time. The guide totally disconsidered the highly dangerous conditions up the mountain and went up immediately just after one week of heavy snowfall. On July 8th the helicopters evacuated two clients. One from Amical Alpin. One from Kobler&Partner. One with pulmonary edema (he was brought back to base camp with severe frostbite as well as breathing supplementary oxygen). The other with snow oftalmy. It shall be noted that until before the summit push, the clients only spent one acclimatization night at 6400m only. Where is the responsibility of the guides for their clients? It is all about money, big money for the commercial outfitters. And for that they need the summit. The summit became "a must" for the safety of their future business. And then you have a look at the statistics. And you see an incredible number of "summits". And say for yorself...wow!! !...G2 might be the right mountain for me. And then you come here and you die. If there are no fix roped in the key sections, maybe 80% of the people will not get to Camp Two, let alone reaching the summit. Having just reach the summit plateau of Cho Oyu is not the summit, Sisha Central is not Sisha summit, Broad Peak rocky fore summit is not Broad Peak summit, fifty meters under a summit is not the summit etc etc etc. Sorry! Sorry ! Sorry! …but no sorry! I wrote this from a deep respect of the bold mountaineers who have the power to turn only few meters from the summit due to bad weather or poor mountain conditions and have the dignity to say "I did not reach the summit!" What do we call a summit? I think the true answer deeply resonates in all of us, and we might as well get the "glory" and the appreciation of the others as being "the summiters" but we will never be able to hide the facts from ourselves.